Courtney pours what’s currently on tap- today a draught of Brainless Passion, from Epic Brewing Company out of Denver, Colorado. 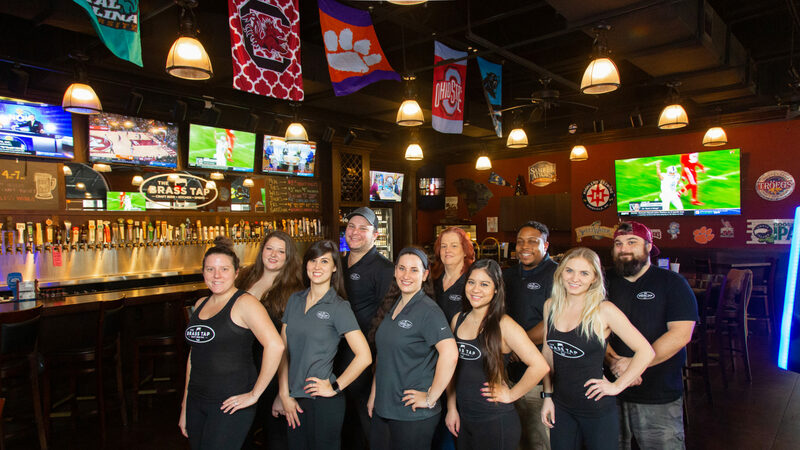 The Brass Tap opened on January 6, 2016, in the Market Common. The craft beer bar and upscale pub-food-eatery is part of a corporate chain with about fifty franchise locations. Last October, the Market Common venue changed ownership and had a grand reopening. 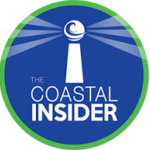 The new owners are based out of Mount Pleasant, SC. They purchased three locations under the new company they formed— SBS Brewing Masters Inc.
Courtney has been with The Brass Tap since the day they opened. She was hired in 2015, while they were still building. She went through corporate training and beer school, then was promoted to a shift manager, and eventually general manager. 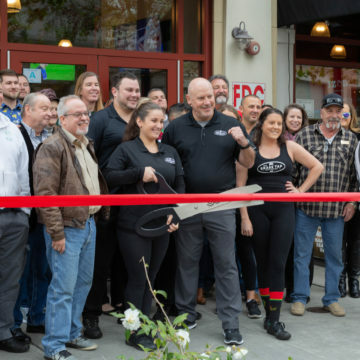 The Brass Tap changed ownership and had a grand reopening in the Market Common. Courtney Dumont (front and center), wielded the scissors and made it official. “It was a really positive addition,” Courtney says, “to have someone who acts as a direct link between the general managers and owners. He brought in backing for the general managers as well as organization. There became greater communication between the three stores— all of us were more in synch; and all of us revamped what we were doing. It brought in a new energy and structure of support. 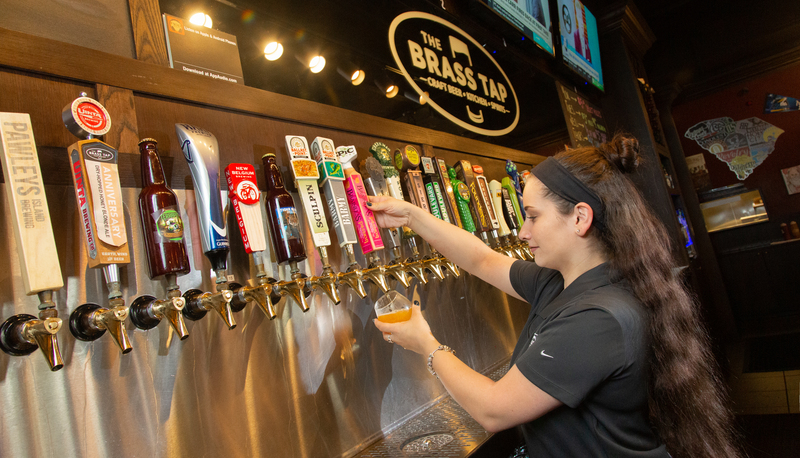 The Brass Tap offers a constantly rotating selection of 120 different craft beers— always 60 on tap, and 60 in bottle or can, as well as beer tastings and flights. They are not a brewery and don’t make beer on site; rather Courtney samples brews from all over the world, and selects their best one or two to offer for a limited time. On any given day, the Brass Tap will have between five to ten new beers. When original brews hit the market, Courtney grabs them knowing that they will be something innovative that no one in the area has ever tried. And when her distributors have only two kegs of a limited edition, she’s the first phone call they make. The Brass Tap has a loyalty program called ‘The Brew Crew.’ With every new draft bottle or can purchased, you receive a point. As you gain points with purchases, you earn money back in rewards to use in-house. Though their concept is craft rotation, there are a handful of well-known domestic beer brands that they keep in-house for those tip-toeing into the world of craft beer. 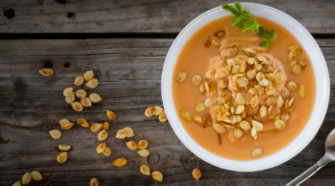 In addition to beer, The Brass Tap serves upscale pub food, with menu items like fresh prime rib, buffalo chicken wraps, and street tacos, which won first place in the Taste of Market Common, an annual competition in which the public votes on their favorite dishes from local area restaurants. The venue has over twenty televisions, and one 82 inch HD TV that they feature all the big games on. They also have a full wine and liquor menu, and a newly added bourbon whiskey menu, with bourbon flights and tastings. The Brass Tap is the only place in the Market Common besides Gordon Biersch that offers a happy hour that is every day of the week, from 4-7pm. And they are known amongst those in the know, for their ‘Bottomless Mimosa Brunch’ on Saturday and Sundays from 11am-2pm. For $30 per couple, guests receive two entrees and all you can drink mimosas. Brunch items include Southern staples like biscuits and gravy, and sausage-egg burritos. They have in house entertainment Tuesdays through Saturday evenings, with the chance for patrons to win gift certificates to The Brass Tap. And there is live local music every Friday, as well as karaoke on Saturday. “There’s something for everyone here in terms of craft beer, cocktails, and entertainment,” Courtney says. The Brass Tap team from left to right: Mattie Tippett, Kelsey Dean, Ashley West, Brett Arutz, Courtney Dumont, Shaye Creamer, Steffanie Delgado, Christian Townes, Megan Floyd, and John Wilson. The Brass Tap, 3090 Deville Street, Myrtle Beach SC 29577. 843-945-1747. www.brasstapbeerbar.com; Facebook @ The Brass Tap Myrtle Beach. Open Su-Th 11am-11pm; Fr & Sa 11am-midnight (Close time flexible. Open as late as you stay out; summer hours open later.) Bottomless Mimosa Brunch, Sa & Su 11am-2pm. Daily happy hour, 4-7pm, $3 vodkas and house specials. Puppy friendly patio outside.